You must be a member of the Manchester Motorbike Lovers Group to attend this activity. Would you like to join this group? Happy new year bikers and bike-lovers! With our bikes safely parked for the winter, waiting for sunnier & longer days to return, it's a good time to catch up in a warm place, complain about the weather and make riding plans for the year! Join us for a brunch in the gastro-food heaven that is West Didsbury. 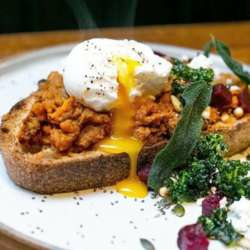 Depending on numbers signing up, we'll try to get a table a Thyme-out or Another Heart to Feed - two excellent brunch spots on the popular Burton Road, with the Metropolitan as a safe back-up option.